There is nothing like Confirmation in this world, and perhaps it’s because the Sacrament is otherworldly. Yesterday we had the privilege of seeing my 17-year-old son confirmed with his classmates at St. Lawrence Seminary High School. To see those 21 young men receiving the Gift of the Holy Spirit was not only a visible sign of their faith, but a magnificent spiritual rekindling of our own. Of the seven sacraments instituted by Christ, Confirmation is probably my favorite, if we are allowed a favorite! And it is all about personal choice! No one is forced to receive the Holy Spirit in this special way. The Sacrament of Confirmation is a sacrament of deep spiritual maturity. It enriches the soul of the person with an abundance of graces. It is also the sacrament that calls recipients to witness courageously the gift of faith by word and, especially, by the example of their lives. This sacrament brings us back to the great Pentecost event when the disciples were huddled in the upper room and the Holy Spirit, whom Jesus had promised them, came upon them in the form of a mighty wind and tongues of fire. The disciples gathered there had been commanded by Jesus to take the good news of his death and resurrection to the ends of the earth. Yet those gathered there, up to that point, lacked a real understanding of what Jesus’ life and death fully meant. But at the Last Supper Jesus assured them that the Holy Spirit would come upon them and teach them all they needed to know. They would be strengthened to go everywhere proclaiming Jesus as Lord and Savior. Pentecost was the moment of their confirmation. This is the same gift presented in the Sacrament of Confirmation today! The basic effects of Confirmation are a deeper relationship with God; a closer unification with Christ and a reminder that each sacrament we receive is an encounter with Jesus himself. Confirmation increases in each person the gifts of the Holy Spirit: wisdom, understanding, counsel, knowledge, piety, fortitude and fear of the Lord; it strengthens our bond to the Church; and gives us strength to spread and defend the faith by word and deed. If we consider what strengths we need to live our Christian, Catholic lives in our present society and to make moral decisions in the face of serious temptation, it is easy to see how we need wisdom and strength. No matter what our vocation, married, religious, priesthood or single, we need the strength of the Spirit in our lives. May God bless our new confirmants and congratulations to my son Erin Patrick Joan of Arc! 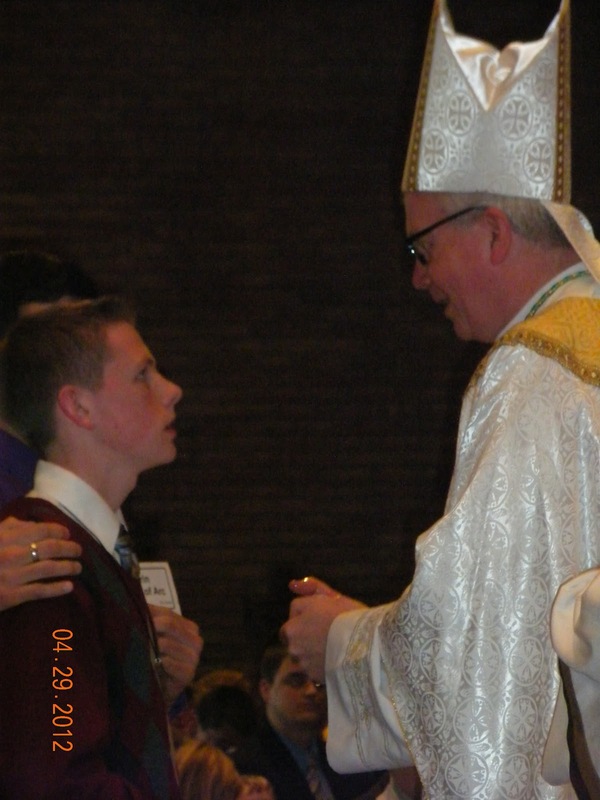 This entry was posted in Sacrament of Confirmation, St. Lawrence Seminary High School. Bookmark the permalink.